Thank you everyone for your kind words and new year wishes. I hope the start of the year has been nice and relaxing (or completely frantic, depending on your preferences). It seems difficult to start with the new year with the past still lingering in the background. 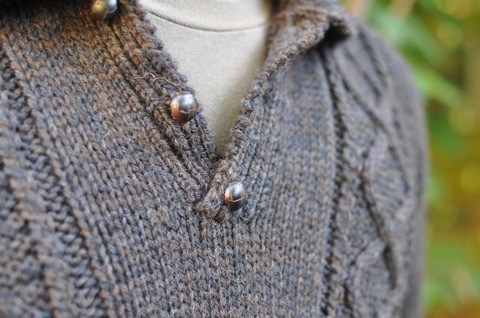 As mentioned in the previous post, I’m really pleased with 2010’s last finished knitting project. This is the second jumper I’ve made for Matt and I think it was a much greater success than the first one. Most importantly, this is the first attempt at knitting it, as opposed to the one and a halfth or second or whatever version I got to on the suave sweater. It’s also a bit more fitted than the first one so I think it’ll get a bit more wear. All in all, another win for Patons knitting patterns from the 70s! Cascade 220 was great to knit with. The yardage/meterage was fantastic and the colour matched the pattern well. Initially I had concerns the twists would disappear in the slightly flecky yarn, but I think it looks fine. Most importantly, 6 skeins was exactly the right amount. There’s probably enough left over for a hat, but not much more. The buttons, as usual, are from Buttonmania. Normally the end of a project signals the beginning of another. In this case, finishing Matt’s jumper brought me back to two works in progress which is my usual number. I’d love to start something new, and have already chosen my next project, but really must finish something off first! I’m in love with that pattern, and the Cascade Bainbridge. That’s the second time I’ve seen that yarn in something and it is just a wonderful colour and texture. Will have to make myself something in it, I think! Anyway, you’ve done a fab job. I think this may be my favourite project of yours yet! Stunning sweater! Absolutely perfect in every way, the details are gorgeous. That certainly is a dashing jumper! I love it, and I do love cascade 220 as well, I just cast on for a project with it : ) I would love to knit a jumper that was so intricate, gorgeous! Dashing indeed! It looks awesome and the buttons really add something. gosh thats gorgeous! just so perfect in every way. 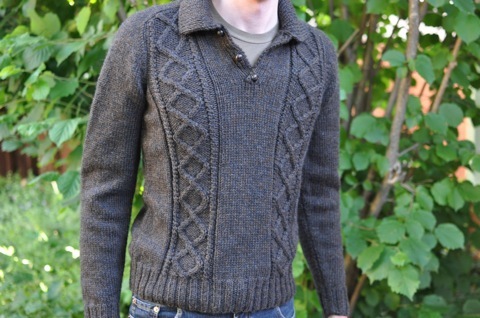 ive not seen anything knit in c220 that didnt look amazing, such a great yarn, but really your workmanship is beautiful. those buttons are to die for! Awesome work Emma 🙂 Bound to be a winner! This came out really really nice! I like the color, the styling, the workmanship. Really a cool sweater! That is absolutely lovely, Emma – well done.